Happy 4th of July to all of my American readers and friends! Whilst you get the day off we get to have longer shifts at work due to zero coverage from our US counterpart (the joys of working in finance haha), but other than that enjoy your day! Just in time for this special occasion, I thought I'd bring an Americana inspired outfit to the blog today because patriotism is trending and this American style trend is hotter than ever. If you haven't seen this trend around yet (where have you been? ), take a look at Marc Jacobs amazing Spring/Summer 2016 show here which hit all the right spots for the fashion crowd and really nailed this style. The catwalk collection had a strong Americana theme, consisting of ostentatious looks with sequins, lace, lots of denim, mix-and-match pieces, an overflowing 70s vibe and some rather cool accessories too. Other designers such as Kenzo, Lacoste and Max Mara also showcased influences of the theme, in a more muted way and perhaps easier to be worn outside of the catwalk. Designers took the red, white and blue idea to a new fashionable standard and in short, that is what the Americana style is all about. The free-spirited Americana looks exudes the mood of old-Hollywood movies, pop tunes, burgers and milkshakes as well as all the loved cliches. Fringed accessories, faded denim, and star and stripes prints are the way to get on board with this look, but if you are looking for something a little more sophisticated and subtle, try a combination of red, white and blue pieces, just like I did in my outfit today. These shades will work perfectly and even though you may not be celebrating Independence Day, this trend is one of the most fun to try this sunny season. To say that I've been loving anything and everything Banana Republic is an understatement. 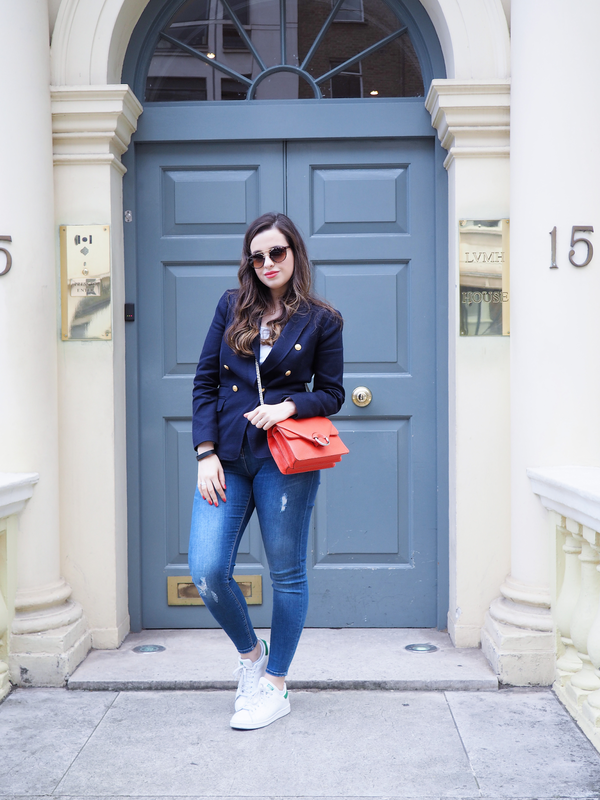 If you read my Instagram roundup post last week (here), you will know that their signature trousers are now my favourite pieces and I may just be adding this blazer and bag to that list too (not to mention the dress and other 2 bags I got too). 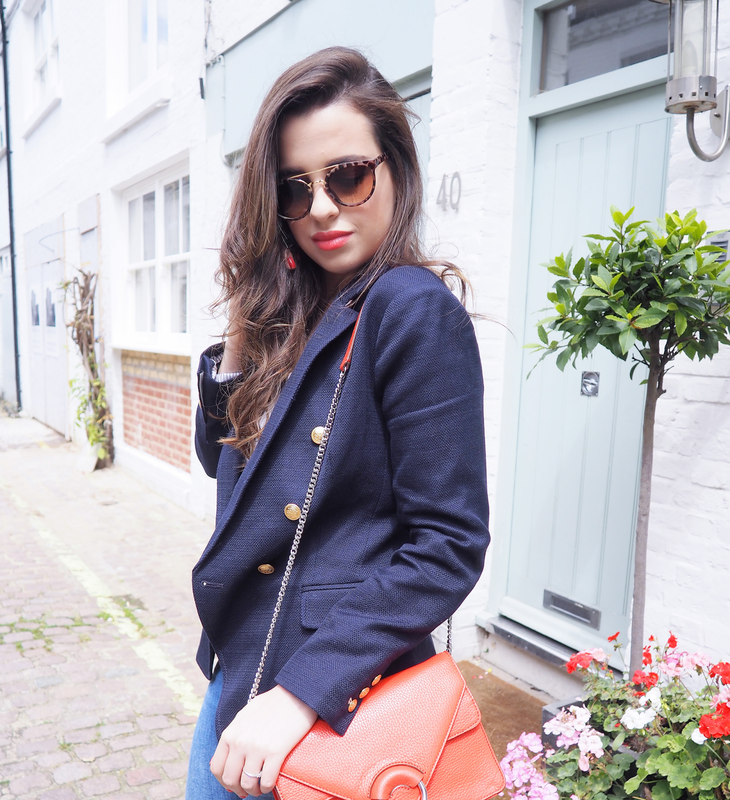 I wore this striking red bag for the first time last weekend and many of you took it to my Instagram photos (@pamella_scalfi) to ask about it; needless to say, it was a hit and now you know where I got it from! The quality of the leather is impeccable and I can't believe it's currently on sale so make sure to check it out! The blazer on the other hand, is the ideal summer cover up, especially when you're in a country with temperamental weather like the UK. I've been wearing it non-stop both for work during the week and for play on weekends. 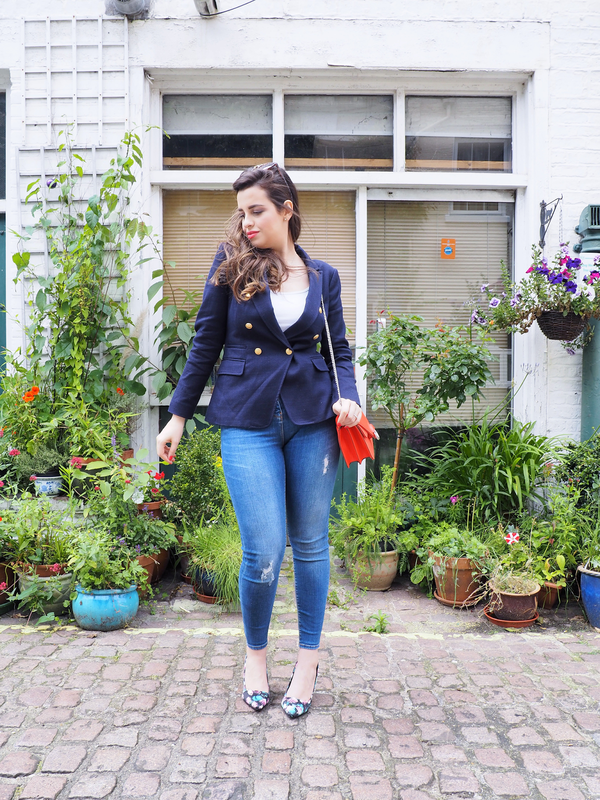 Everything else in the look is pretty standard and whilst I could have gone with a nice pair of red shoes to really up the Americana vibe, my pretty yet slightly forgotten floral shoes wanted to come and play so they did. I'm very satisfied with the end result and I find that it ticks all the right boxes for the trend. What do you think? Special shoutout to Banana Republic for all these pretty pieces! Tell me, will you be trying the Americana trend this season? Let me know below! Thanks for reading beauties and have a nice week ahead! Looking lovely hun. Nice of you to style a July 4th outfit. Hola muy buenos días, me encanta tu americana y su color. El look perfecto. Un besazo. You look so so chic Pam, every time you ate more stylish! You look so lovely! I love that bag, how pretty is that! I want one!! This is absolutely to a stye I would feel comfortable in, but I like the colors and how you styled it. I love this look! Happy 4th of July to you all. Sorry you don't have a holiday but if it makes you feel better we don't have a 4th of July holiday in my part of Africa!! 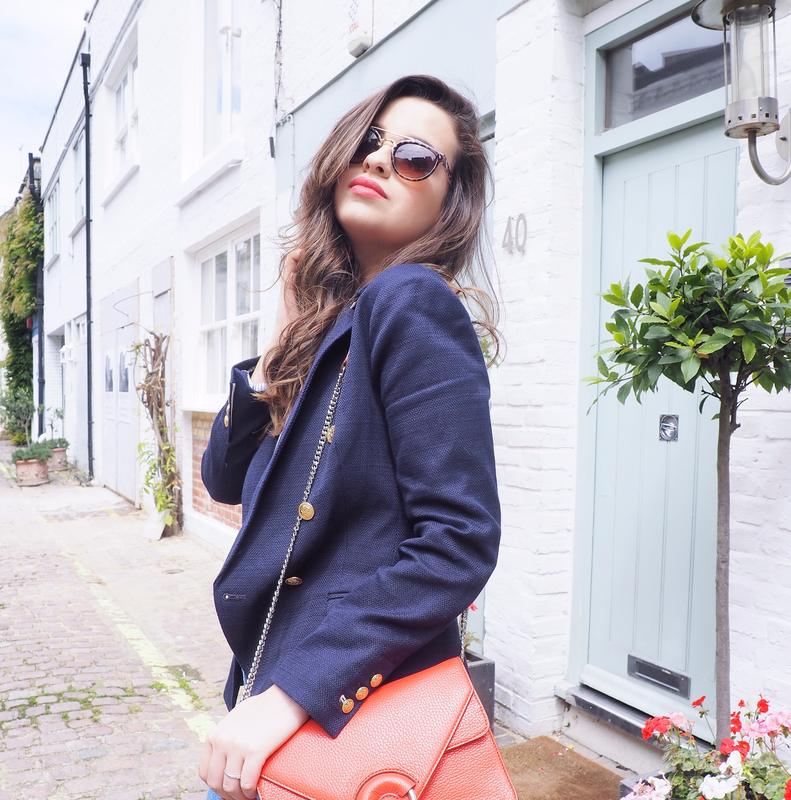 Love the look of the blazer, you look pretty! Love how you dressed the look with heels and trainers as an alternative look! Love how you style pieces Pam! And I love that bag! Que lindo look amei as imagens, tenha uma semana abençoada. I like the Americana style very much, dear Pam, and you look really lovely! I am not on Instagram, so I didn't see the Banana Republic feeds :) I agree with the jacket because of the British weather, you did it right! Plus, it i beautiful! 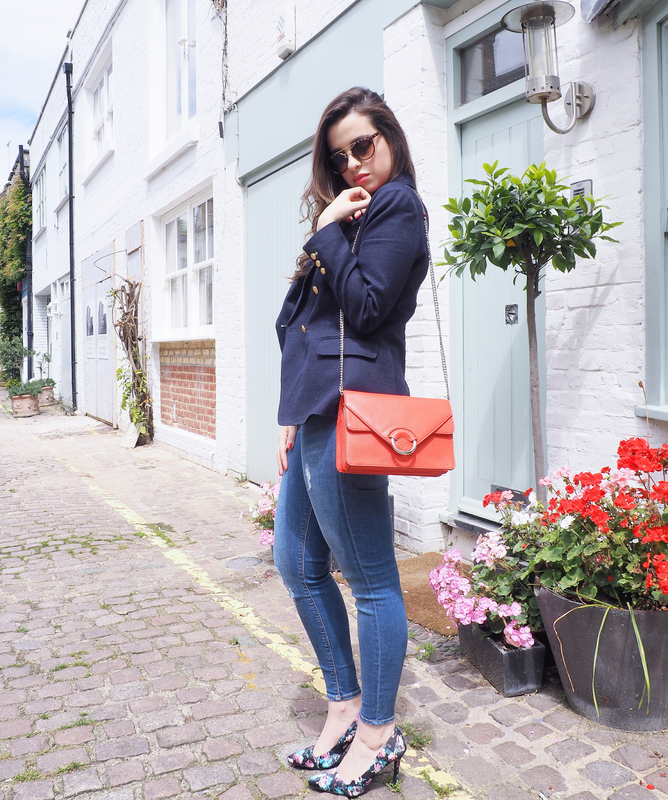 I liked the jeans and the floral heels - I loved them and the bag as well! Red is my favorite color! You look stunning with both variations, the trainers are also lovely! Hope you have a great week! You are so beautiful dear!! Love your outfit and hair!! Such a gorgeous look, Pam! LOVING the blazer and those shoes! Really love those pumps! Such a pretty pattern. I hope your day was good and thanks for the holiday wishes. Girl I'm also loving everything from Banana Republic!! I think I have the same trousers as you mentioned. 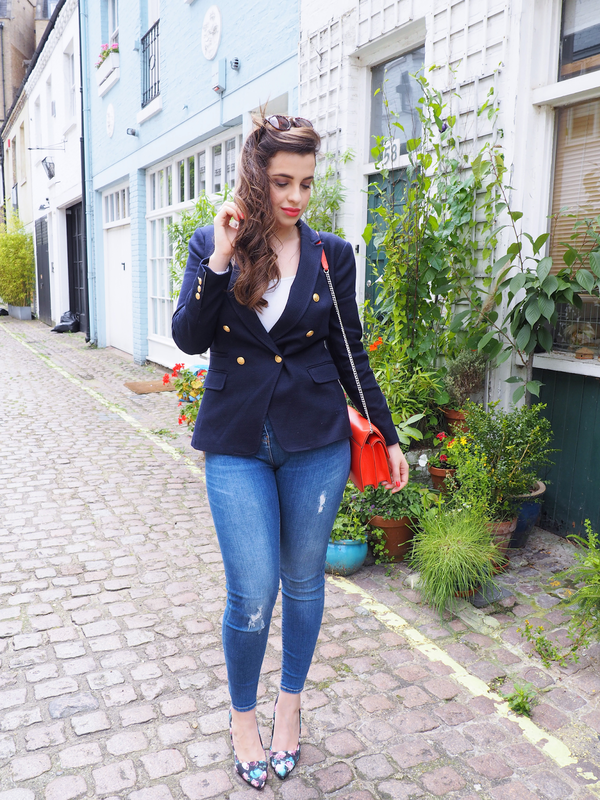 Navy blue blazer is perfect. I love this outfit! Great outfit! I love the unexpected print in the floral heels! Such a cute jacket Pam, I really love this look. Loving this whole look, Pam! The floral heels with the jeans looks super cute! Wow you look so stylish! I am happy to have found your blog :) You are a true inspiration! Love the styling and that bag is so pretty!! First of all, congratulations on your collab with Banana Republic, I love the brand! And gosh, that blazer and bag is gorgeous, Pam! I've been really loving BR recent collections! I adore chic look! I absolutely love your outfit and that coat is perfect!